Thank you for helping us celebrate the milestones and may we see you around again. "Thank you so much for your kind thoughts! It's been a wonderful ride and we have made so many friends. We close the 27th and through some ironic twist of fate it may prove to be our best promotion we never planned!" Very sad...such good food and service. I hope its not because Crooked House moved into the neighborhood. Salem can only handle so many $20+ a plate venues. It is very sad whenever a great place even a business closing, I have noticed more and more businesses shutting there doors, first i was sad when Coffee House shut there doors but I think that we will all shuffle to find somewhere else to dive into good eats and good atmosphere let's hope someone picks up the torch and creates great grub! This is incredibly sad. best restaurant in Salem. Superior food and service. If he was downtown or at least a little more visable to south salem audiences, he would be packed every night. Wow, one of the few places I could count on for a consistently good meal. We have walked into the Crooked House 3 times and waited and waited and no employee even showed their face...a member's only club I guess. Salem is losing one of the best things about it. I came here to help make Salem the great place it could be and to see this happen makes me angry and in part want to leave Salem. We should be supporting the businesses that provide truly excellent food and service (only once did Morton's fail on this front). 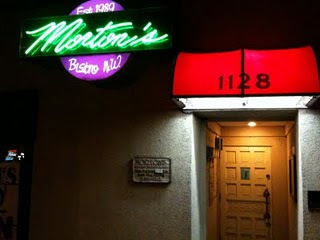 sad to see Morton's go.. But I'm very excited to be a part of the new restaurant that will be occupying the space. Broken Bread is the name of the new restaurant, Chef Adam High will be in the kitchen and is my business partner. Adam worked with Steve at Morton's early in his career. We are still very early in the process of setting up the restaurant but hope to have our doors open early this fall. Watch our Blog for other news.